Set off the road in a close of luxury properties, the property offers 6 bedrooms and 4 bathrooms, as well as a 12m by 6m gated pool and just a few minutes walk from Carvoeiro. With 3 beaches within a 10 minute walk there is no need for a car. On the ground floor there are 3 bedrooms and 2 bathrooms, a large lounge/dining area with a wood fire and air conditioning. There is also a separate sitting room with a satellite TV with DVD player. 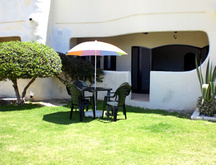 The property has a large fully fitted kitchen which caters for all your self catering needs. From the Lounge there is access through large patio doors to good size terrace with BBQ and outside table and chairs. On the first floor the property hosts a further 3 bedrooms and 2 bathrooms. All the bedrooms are a good size. There is a further terracing area from the first floor. There are fans in all the rooms and also for winter lets the property has numerous radiators, air con that can be used as heating and log fire. The area is great for walking, whether on the cliff tops, by the sea or through the country. Carvoeiro offers Banks, shops, bars, restaurants, entertainment, beach, boat trips (to the Grottos). There are restaurants about 3 minute walk from the Vila. Most activities are close by, Golf, Horse riding, Tennis, 3 water parks in the area, shopping centres and more, see our website or contact us. The 9 hole par 3 Vale do Milho golf course is within 2km and other more challenging courses are within 30 minutes drive. These include the Gramacho and Pinta courses on the Pestana complex. Championship courses include Vale da Pinta near Carvoeiro and the famous Penina course near Portimao. A golfers paradise. Faro airport is approximately 45 minutes drive away. 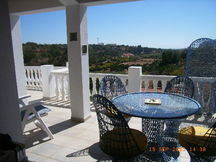 Carvoeiro is about a 3 minute walk and the towns of Lagos, Silves & Portimao are up to 30 minutes drive. A leisurely day trip would include the Monchique mountains and Cape St Vincent with other areas of the western peninsula. Please quote reference: a4m: 756 villa "Casa Carvo"